If someone told me that the classic Caesar salad was invented in Tijuana, Mexico, I’d say they were crazy. But that’s one bizarre truth in the creation of one of the world’s most iconic salads. Famous restaurateur, Caesar Cardini, ran a restaurant in San Diego back in the early 1900’s. But when Prohibition hit the states, he opened another location in Mexico…Tijuana, to be exact, luring many of the day’s Hollywood stars across the border. They could gamble in Mexico, and they could feast on food and alcohol at Cardini’s. The story goes that one July 4th, they were running out of food, and thinking quickly, Cardini created a salad at the spur of the moment, using only the ingredients he could find in the kitchen. Having the chef assemble the salad tableside meant it came with a grand performance, and word quickly spread of the incredible “Caesar salad.” (Cardini named it after himself.) Cardini’s is still at its original Tijuana location, and they serve thousands of Caesar salads, with a flamboyant tableside show, to tourists. It needs to be said that raw egg yolks are used in Caesar salad, and if you’re not comfortable using them because of salmonella concerns, you shouldn’t. Sometimes coddled eggs (slightly boiled) are used. Many recipes contain a variety of egg substitutes. But for me, it ain’t a Caesar without raw egg, so I’m willing to take my chances. The Caesar salad that I compare all others to is the one my wife first made me when we were dating. I don’t want to say that it convinced me to marry her, but it certainly factored into the equation! 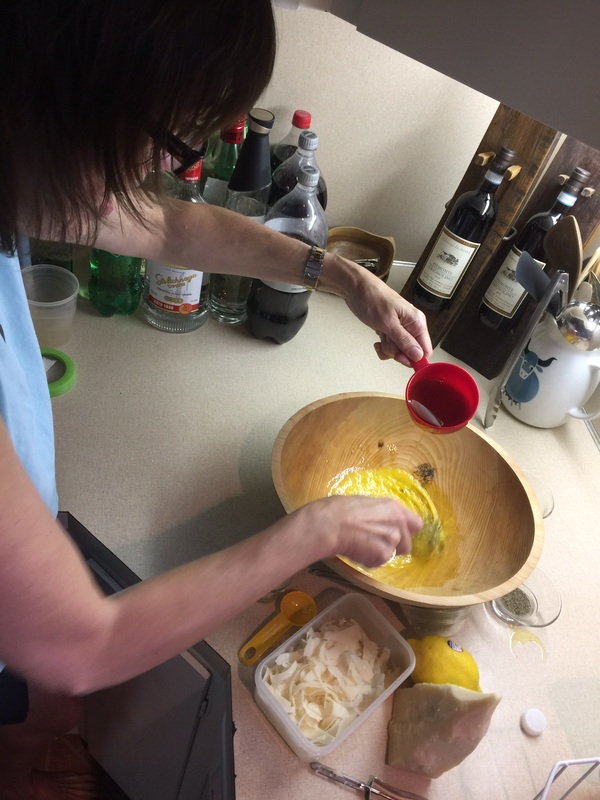 In presenting this Caesar salad recipe, she reminded me that she had promised the friend who first made this recipe for her that she would never reveal all of its secrets. But the great thing about recipes is that one slight change is all it takes to make someone else’s recipe your own…and that’s exactly what I did. No promises broken! The first really important ingredient to get is a wooden bowl. No other bowl will do. 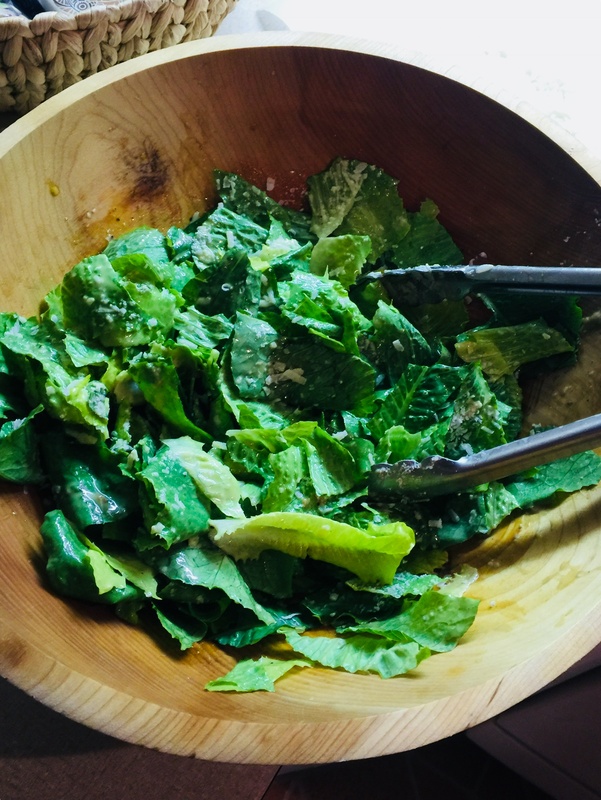 We have an old wooden bowl at home with almost mystical properties that is used for nothing but our Caesar salad, and I have to say that it makes all the difference in the world. 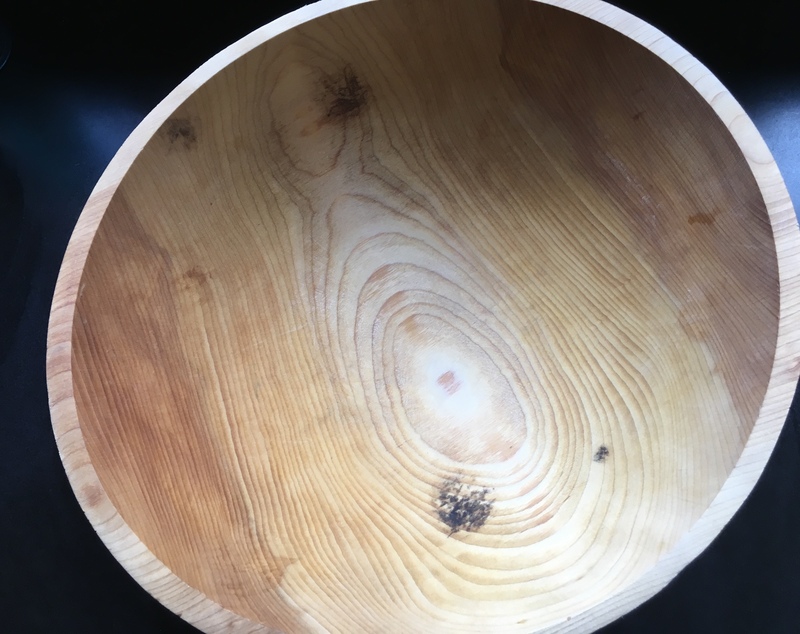 The mystical wooden bowl. Years of Caesar salads have given it a special seasoning. Once you have the bowl, what matters most is the freshest, best quality ingredients you can find: farm-fresh eggs, not supermarket ones…Parmigiano Reggiano, not generic Parmesan. The best quality extra virgin olive oil. Fresh lemon juice. Freshly cracked black pepper. High-quality anchovies. After that, it’s all about the love. 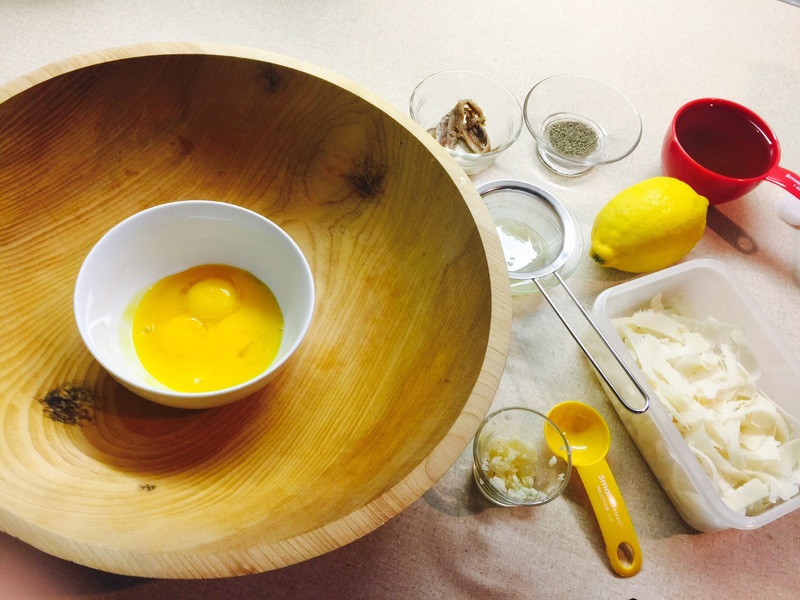 Place the egg yolks in the wooden bowl and whisk them until well mixed. While whisking the yolks, pour the olive oil in the bowl VERY SLOWLY, whisking all the time, never stopping. Keep pouring the olive oil slowly until you’ve whisked all of it into the eggs and you get a beautiful emulsion. Keep whisking and add the Dijon mustard, then the black pepper. Add the anchovies, mashing them with the whisk as you combine the ingredients. Don’t leave any chunks of anchovy. You want it to dissolve completely in the dressing. Once the dressing has reached its desired consistency, add the lemon juice and whisk some more. Whisking slowly, sprinkle in the Parmigiano Reggiano. When it’s all mixed together, dip a finger in the dressing and give it a taste. Does it need more lemon juice to cut the oil? Slice a second lemon and add a little. Taste again. Is the tanginess of cheese dancing on your tongue? If not, grate more and add a little more. Enough black pepper? There should be enough salt from the anchovies and cheese. If you think you’ve “got it,” add the Romaine leaves to the salad bowl and toss gently to coat the lettuce. When serving, top each salad serving with a little more cheese. Extra anchovies are optional. If you’re saying “where’s the garlic?” …you’re right. Every good Caesar needs some. This recipe would use about 1 tablespoon of fresh, finely chopped garlic, added after the mustard. If I’m cooking alone, I always add the garlic. But we have people allergic to garlic in our household, so when family is here, we leave it out. The flavors of the dressing are so deliciously intense, you’d be surprised how good it is without it!